The Resonance Code Key provides a list of questions that guide you to work with the archetypal patterns indicated by the hexagram. Each hexagram portrays an energetic signature of evolutionary changes inherent in the situation you are inquiring about. The Key is also intended to serve inquiry processes such as 5-Phase and Feelingwork taught in the Voyage course. According to the Resonance Code structure, each hexagram is composed of three inter-locking bigrams, Wave, Particle and Resonator. There is a 2-by-2 table associated with each of the bigrams, each providing 4 options. The permutation of these three sets of four gives rise to 64 archetypal patterns (43=64). Incidentally, the same mathematical structure also underlies the structure of 64 DNA codons, where 4 nucleotide acids permutate through 3 positions. DNA is nature’s way to encode the information about biological evolution into genetic materials that pass the codes through reproduction. Each of the three 2-by-2 tables represents a set of deeper principles underlying the structure of Resonance Code, the details of which are outside the scope of this essay. This essay explains the essentials for using the Key in one’s inquiry through hexagrams. The Resonance Code Key departs from the conventional scheme of I-Ching texts which prescribes actions, imparts moral judgement, or provides answers. Instead, the Key employs questions as a probe, helping one to uncover the unique wisdom inherent in your evolutionary process and development. With this Key, you may begin to compile your own library of evolutionary archetypes, composed of your lived experience and embodied learnings. At the same time, there is a wealth of collective wisdom in the traditional I-Ching text regarding the subtle energies embedded in each hexagram. This wisdom is subtly implied instead of explicitly stated. I attempt to shape the Key to embody my understanding of these subtle energies through synthesizing my experience of both the eastern and western cultures, practices of Taoism, acupuncture and Chinese medicine, as well as my career as a scientist. Here we assume the focus of an inquiry is a self. Yet, this self is meant as a changing, fluid process, not a fixed entity with rigid, persistent, or even categorizable features. Self is an ongoing process of forming and un-forming, being and becoming, rising into the fullness of order and returning into the emptiness of entropy. This self can be any system capable of self-reflection, ranging from an individual to a relationship or a collective group. Particle Self refers to the part of self we can directly access with our linear, rational mind. It is the known self with a set of agencies and an identity well-formed throughout our development. Wave Self refers to the part of ourselves that our rational, knowing mind does not have direct access to. It is the unknown portion of our soul’s journey that we have not yet taken. Wave Self rests in or emerges from the mystery. It may aspire to take us to the highest expression of our potentials, and also show us our limitations by revealing the most vulnerable or even darkest parts of ourselves. Since Wave Self is only potentials instead of having manifested forms, it may exist as a field of subtle forces, gradually unfolding and threading through circumstances occurring over the course of the self’s life. We also can refer to it as the Wave Field. This field “communicates” to us through each situation we live in, each event that is happening around us and each person we encounter and relate with. 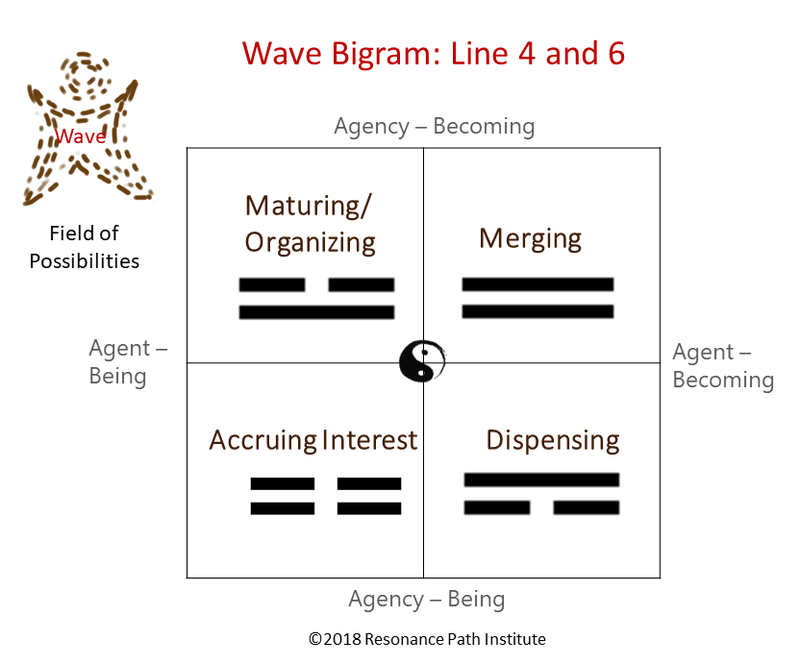 The premise is that Wave Self, or the Wave Field, is a function of who we are at the deepest core and the life trajectory we have carved out with the totality of our actions, attentions, thoughts and feelings. Resonance Code provides a structure through which our rational, particle-izing aspect of mind can establish a resonant relationship with the Wave, so that the Particle Self can be an instrument, rejoicing in being played by the loving and skillful hands of the Wave Self, or the harmonious vibrations of the Wave Field. When we work with an inquiry, especially at the beginning phase, it is often easier to start with the Particle Self. 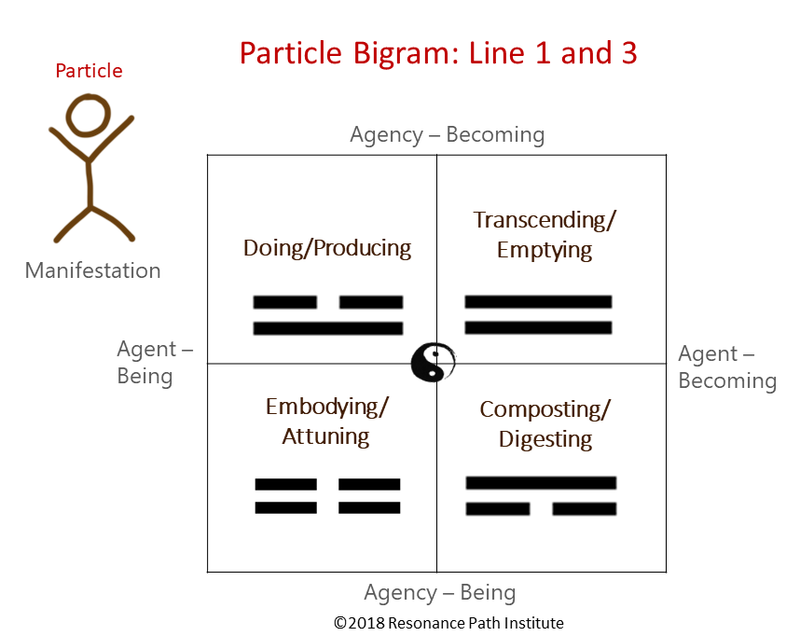 Following the questions associated with the Particle Self, we may direct our attention towards the aspect of the Particle Self being indicated in the hexagram. You may combine these questions with your 5-Phase inquiry to delve into the finer resolutions of Particle Self. The answers to questions associated with the Wave Self usually are not immediately obvious. By definition, Wave Self or the Wave Field is something we do not yet know. If you feel like you know your Wave Self very well, that might be a previous version of Wave Self that has already been particle-ized. If you want to glean fresh information about how the Wave Field is currently interacting with your life space, please read A Guide to Wave Self (coming soon) to look for further clues. When you work with the questions to Wave Self, please hold them in your mind lightly instead of rushing towards answers. The answers to these questions will be revealed to you as time passes. Please simply observe and listen for cues, signs, changes and dynamics arising internally in you, externally in your life space, or through synchronicities or dreams. A few days or weeks after the reading, you may work with these questions associated with the Wave Self retrospectively and weave new patterns out of the myriads of threads you have noticed. These patterns may help you to construct a “hypothesis” about how your Wave Self is relating with you through this inquiry. When we engage with this practice, we are training our rational mind into a new role. Instead of being the Executive Director, always taking charge or controlling, it is now learning how to observe and gather information coming from non-rational channels in order to weave new patterns of meanings. These new meanings will be the basis for a hypothesis about Wave Self. (Those who had experience participating in Fieldtuning may reflect on the role your rational mind played there.) The rational mind will not lose its executive function. Quite to the contrary, this practice prepares its executive function to be taking on roles potentially far more satisfying and in alignment with a self’s sense of wholeness. Once we form the “hypothesis” about the Wave Self, then it will be up to the Particle Self, our known self, to decide how to respond to this hypothesis. Is this a hypothesis worth testing? How shall the Particle Self go about to test this hypothesis in real life? If not, how can the Particle Self refine the hypothesis in a way that would motivate new actions or generate new choices? If you are working with Resonance Code, you are most likely already working with a fresh way to pay attention to things. Journaling, drawing and active imagination all provide excellent ways to communicate between parts within yourself that have not been connecting. Communication between you and someone else may require more skills beyond the scope of this essay. Creative actions can take a wide range of options from having a conversation with someone in your life over a difficult topic to starting a new or stopping an old routine or developing a new skill or agency. Throughout this process, it is very likely you will discover resistance or unhealed trauma in you that blocks the resonant relationship between your Particle and Wave Self. 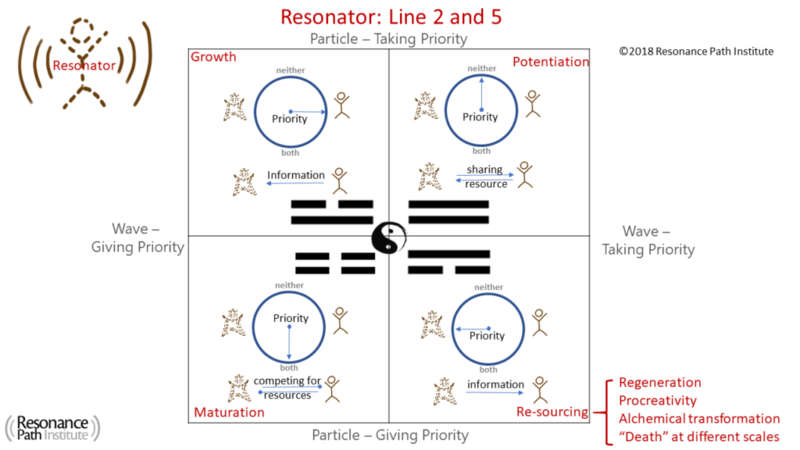 Processes such as the 5-Phase and Feelingwork will help you to uncover those parts and move towards resonance. Then you will reach a point where you feel like you have absorbed what you can learn from the energy of one hexagram. Sometime a particular inquiry may take years to complete. Yet you can start working with the next inquiry that is fresh to your awareness once you feel like the previous one has reached an equilibrium. This is an iterative process. A more frequent inquiry will help you familiarize the energies of all 64 patterns in a relatively shorter period, thus generating a broader perspective. However, taking time to dive into each pattern will help you immerse deeper into the nuances and textures of each hexagram. You may dial into the sweet spot between breadth and depth, and find the rhythm that best suits your needs and styles at different phases of your practice. This process of observing patterns, constructing hypothesis, testing and gathering new information iterates itself and propels evolution. This process lies at the core of scientific discovery. The rich web of scientific knowledge we know about the natural world comes from this process. All the important technological inventions our modern life relies on is rooted in this process. It will be a powerful synthesis to apply this process towards knowledge about our inner world and our evolutionary unfolding. The finer details for working with Resonance Awareness will be presented in a separate essay. For new explorers who are just starting to practice this work, it may be sufficient to read the descriptions associated with Resonance Awareness and record your reflections and intuitions through the inquiry. A more in-depth study with the Resonance Awareness will be for the next level of practice. Working with Resonance Code is like learning how to improvise jazz with life. The 64 hexagrams are 64 basic riff patterns you need to learn and practice in order to jam with life forces reverberating around you. Once you are proficient, you may have a hell of a lot of fun, thrill and deep satisfaction to express your natural gifts and share them with the world. In fact, you may not need to learn all 64 patterns. Over a decade of working with hexagrams, I have discovered a distribution of the likelihood of how hexagrams show up for me. About 10% of the 64 showed up in my readings with much less frequency than the rest, and another 10% showed up more frequently. You will discover your own score that your soul most wants to play with you. Once you reach a point of fluency with the hexagrams, Resonance Awareness will become alive in you. You will be able to identify energetic patterns in life much more readily without throwing coins, and you will be able to play with the energetic patterns in cultivating personal relationships, pursuing creative endeavors, and navigating collective groups and social systems. 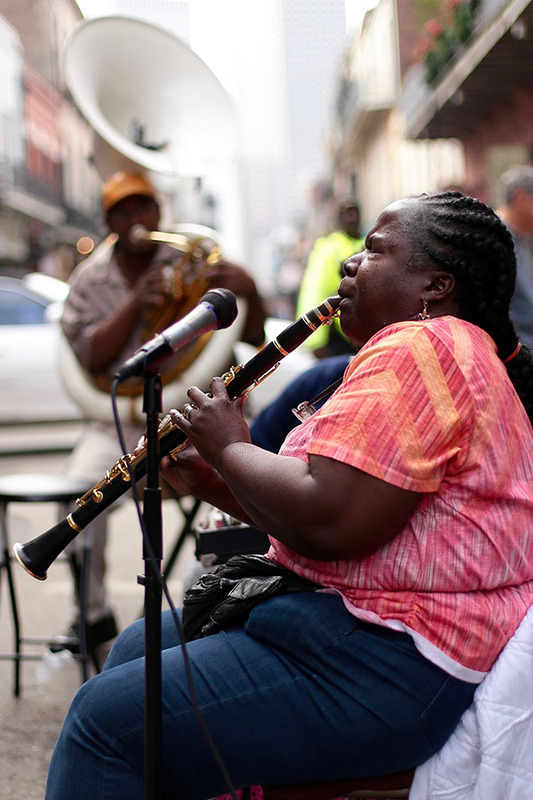 A serious musician-hood takes disciplined and quality training. The amount of satisfaction we get out of playing music is proportional to the quantity and quality of the practice we put in. Same thing with this work. This hypothesis-driven, iterative investigation asks for a level of rigor no less than what it takes for a scientist to study the natural world. Our investigation, however, takes on an even more exciting dimension in that the investigator and experimental subject are both embodied in the same consciousness. This makes for a much more interesting, demanding and also fulfilling journey. It is important to seek allies and have traveling “buddies”! Now you are equipped to start exploring your inquiry with the Resonance Code Key! Th is so helpful, and made so much sense on what this voyage is all about, and implications in our personal and collective evolution in Life, the living relation of the two, as it is One process, although particle self may not experience the two process as One. The article addressed the queries very elegantly and clearly I am holding while trying to work with the key and Hexagrams, it also resonated with my experiences and insights of working with these. Even while reading this, I got fresh revelations of what Wave Self is try to say to me regarding the situation I m inquiring…. Thank you so much for the mastery-full labor in guiding us through the voyage with these beautiful and profound writings! So grateful for you in this world, and your tenacity through life to share this with the world. Spring, I echo the gratitude expressed above, for all you do and share as great gifts. So much packed in here….one quick comment on a minor theme above – the notion of “Jazz”…. this term has come to mean so much and yet so little in popular culture today. I feel the point of your including it in connection with “improvisation” and life…..however to reduce it to simply “learning 64 patterns” is….just not doing justice to Jazz – in my humble opinion!! Now – perhaps by extending the nuance of the metaphor, to indicate such “learning” as attuning to the inner workings of each hexagram….the energetic trajectories….. then the incredible complexity and myriad variation in expressing precisely what the moment requires, desires…..may be conveyed …..